As a proponent of cancer screening and prevention, Optima Diagnostic Imaging has established a partnership with the Beverly Hills Cancer Center to offer patients a unique cancer screening and prevention program at our private Los Angeles facility. These services and recommendations are specifically customized to each person based on their risk factors and special needs and may include genetic testing at our Los Angeles facility. Patients first schedule a consultation with one of our cancer specialists from the Beverly Hills Cancer Center for a physical examination and to assess the risk of developing cancer based on each individual's personal medical history, family and genetic history, and lifestyle habits (such as smoking, diet, and exercise). 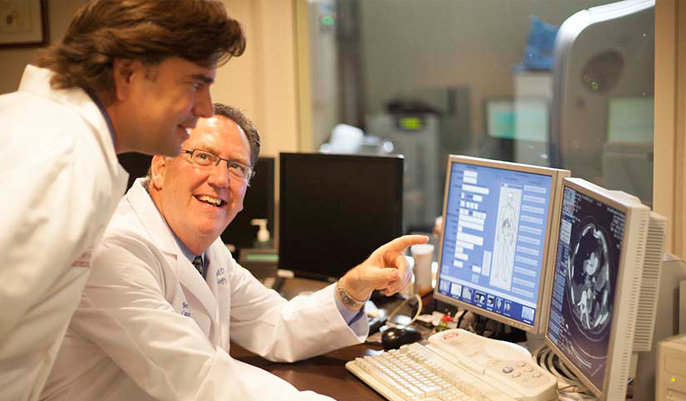 Then, each person is provided with a custom designed set of screening tests, often including genetic testing, at our Beverly Hills imaging center facility that may include imaging (CT scan, MRI, PET/CT scan, bone scan) laboratory tests, and other personalized recommendations and lifestyle modifications. In these ways and more we are proud to provide among the best cancer screening Los Angeles offers. All cancer screenings and testing, including customized diagnostic imaging, if any, would be based on an assessment of the each person's risk factors in conjunction with recently published scientific research which provides specific recommendations for certain high risk individuals. Please see some abstracts from recently published articles below, discussing the importance and dramatic impact of just some of the screening services offered at our center. Abstracted Article: Using CT scans to screen current and former smokers for lung cancer cuts the risk of death from the disease by 20 percent, according to a new study by the National Cancer Institute published in the New England Journal of Medicine. If all current or former heavy smokers over 55 were screened, there could be as much as a 20 percent reduction in the number of people dying from lung cancer, according to the results of the NLST, published in the New England Journal of Medicine. These study results, first hinted at in a preliminary report released last November, offer the first solid evidence that screening high-risk patients using CT scans could reduce lung cancer deaths -- a finding that has at least 20 of the nation's major medical centers setting up CT lung screening programs of their own. If caught earlier, 60 percent to 90 percent of lung cancers are curable, he says, making "a tool to diagnose lung cancer earlier ... a tremendous opportunity." "Knowledge is power. Good, bad, or indifferent, the sooner I know the results, the better," said William Kennedy, a former smoker who jumped at the chance of getting screened when presented with the opportunity. Abstracted Study: Using CT scans to screen current and former smokers for lung cancer cuts the risk of death from the disease by 20 percent, according to a new study by the National Cancer Institute published in the New England Journal of Medicine.